Shreveport Cryotherapy Spa Chill + Heal is now open! Shreveport – Chill and Heal announces their grand opening, Monday, August 22, 2016 at 10am. 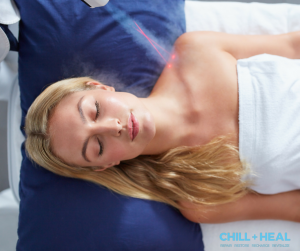 Located at 7607 Fern Avenue, Suite 102, Chill and Heal is a premier whole body Cryotherapy Spa that also offers CHILL cryofacials and spot treatments. Cryotherapy is a cold treatment therapy that elicits the body’s natural healing response. It has been used to decrease pain and inflammation, reduce muscle soreness, reduce cellulite, and to improve skin conditions. It is also a rheumatoid disease relief, an anti-aging treatment and can help provide a quicker post-surgery recovery. Other benefits include enhanced athletic performance, boosted metabolism, improved sleep, fibromyalgia relief, joint disorder relief and increased collagen. Chill and Heal also offers NormaTec Body that uses the patented PULSE technology to help athletes recover faster between trainings and after performance. NormaTec compression stimulates your body’s natural muscle pump to help eliminate toxins and metabolites that can prolong muscle soreness and delay recovery. The heaviness caused by intense workouts is relieved through its compression and decompression technique. This system combines both intense muscle recovery and healing for athletes and fitness enthusiasts. Other treatments available and Chill and Heal include the Chill Facial, Spot Treatments and LED Light Therapy. Additional information is available at info@chillandheal.com.